In early December, I selected Ernest Hemingway's A Moveable Feast for my book group to read. While most of the group didn't share my enthusiasm toward that book, I loved it enough to read both versions. 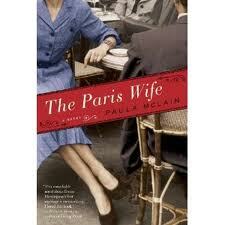 During our discussion, one member of the group whose opinions I value started telling us about The Paris Wife, and she was so taken by it that I figured this book was something I really had to read. You know those blogging memes that ask the question "Have you ever recommended a book to someone and they really disliked it?" or something along those lines -- well that's the situation here, but in reverse. With apologies to my friend Maxine, and feeling like a lone fish swimming against the current, I just wasn't all that impressed with this novel. McLain's book focuses on the relationship between Ernest Hemingway and his first wife Hadley, from their meeting to their decision to divorce, and then adds an epilogue with a phone call from EH to Hadley and then her learning of Hemingway's death thirty-plus years later. The first part of the novel details their time together before their arrival in Paris, but the meat of the novel, of course, as in the couple's real lives, is found in what happens once they arrive there, told largely from Hadley's perspective, with a few entries from Hemingway's writing thrown in here and there so the reader can hear his voice once in a while. The Paris setting is something McLain writes well: the cold Paris winters, the shabby, cramped apartment the Hemingways called home, the Bastille-day celebrations where music playing outside kept them awake all night, the bohemian lifestyle of the artists in residence there, etc. She also shows a changing Hemingway who once scoffed at the rich, but who later "saw a different kind of life and liked what he saw," as he moved from living the life of a poor, suffering writer to noticing that the "rich had better days and freer nights." It is also very obvious that she's done a great deal of research in preparing to write this book. "I was feeling so languid and so drugged, I didn't even know Pauline was in the room until after she'd slipped under the sheets on Ernest's side of the bed. The afternoons were hot and we slept naked. I knew what was happening, and I also didn't want to come awake enough to feel it. I never opened my eyes...No one spoke or made any noise that would shake me out of my trance. The bed was sand, I told myself. The sheets were sand. I was still in the dream." I don't know about you, but if a woman I knew was after my husband slipped into our bed while we were sleeping naked, I'd be a little pissed, and I definitely wouldn't be just laying there trying to ignore things. "He might ultimately fall out of love with Pauline and come fully back to me -- that was still possible -- but nothing was in my control. If I gave him an ultimatum and said she couldn't stay, I would lose him. If I got hysterical and made public scenes, it would just give him an excuse to leave me. All that was left for me was a terrible kind of paralysis, this waiting game, this heartbreak game." Really? Does she really want him back after all of this? All through this book Hadley is depicted as a flat, paralyzed kind of doormat person who shows very little emotion. I get it that she started out as Hemingway's number one supporter, staying out of his way, making it possible for him to write because she felt that was what he needed, but another woman is an entirely different ballgame. As I was reading this novel, I kept saying to myself "why doesn't she do anything?" Okay, she gets sad, but so what? Hadley's monotonal and one-dimensional portrayal is unforgiveable since the book is about her. And the rest of the characters also pale against what is known about them in real life. Zelda Fitzgerald's character is a bit steamrolled here; Scott Fitzgerald barely gets a mention. It's almost as if the author sacrificed character to get to the story, which is already well known. Too bad, really, because in terms of story, she does well -- given the events, it's difficult not to feel some pity for Hadley, and it's also interesting in terms of learning about Hemingway's early career years, so fleshing out the characters would have made this a top-notch read. I'd say that if you have a keen interest in the Paris years, I'd recommend Hemingway's A Moveable Feast, where that time comes alive in terms of time, place and his relationship with Hadley. There's also Gioia Diliberto's biography Hadley, reissued last year as Paris Without End: The True Story of Hemingway’s First Wife. I may have to dig that one out and reread it here very shortly. However, there are many ardent fans of this novel out there, so maybe it's just me. With hefty 4 and 5-star ratings behind this book, readers are finding something to love about it. Thanks for the astute review. I think I;ll stick to A Moveable Feast! Well, as I noted, more people seem to be crazy about this book than I am, so maybe it's just me. But one would think that the character the book is about would have some kind of emotion. It is fiction, right? The author has some license here. I wouldn't disagree that my reaction would be closer to what you suggest, but from my reading of everything I have about Hadley, hers wasn't like that. I actually really liked the book. But then, I hate Hemingway -- I have never thought he had much to say to women as an author that wasn't belittling. So I found it easy to see him from McLain's perspective.